Valerie: This day is the 6th of September, a Tuesday, and we are gathered in Moss Vale. 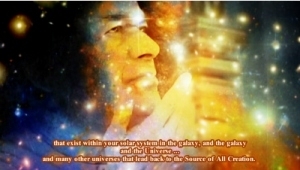 With great love and great respect in our hearts we are calling upon Cosmic Sai Baba to make His Presence among us. ❝I am here! I have been here for quite a while and I enjoy listening to you speaking … … I have said this many times. I like the way the conversation flows … for it gives insight and knowledge to each other and this is important. It is important for everybody to share the good knowledge – rather than negative knowledge – and this is what you have been doing. That is good because it changes the energy around you … and if other people would think about that they would realise that the energy is changing when they speak about good things, nice things, happy things, joyful things! For you live on a planet that has sorrows at times and it does have Joy. The sorrows, of course, are hard, at times – very difficult indeed – but, if you handle them the love of God you will find that they will become a joy in that you will always be able to handle whatever is put before you. And when I say that, I mean – Life’s Journey. Whatever happens to you has a reason and a purpose. The purpose is for you to understand – perhaps something that is perhaps missing in your character – and then if you really work with that – and think about what is missing, or why you re-act to something you know that you are not happy with your own re-actions – you can change that. You can change the feelings. This is important because you are living in a world of Feeling. Of Sentience. It is part of the life that you have in a human body. Everything has feeling. Every race has feeling. You spoke about race a little earlier and it was about the human race – but if you think about how the indigenous people consider and think about a race – they see a race of every similar form, such (shall we say) an animal of some sort. Or a insect or a reptile, the ones that look similar in their minds is a race. The same with the flowers and the trees – and the stones, and the earth – it is all part of what energy is coming together and is what you are made from. So all those energies are actually in you as well. And as humans you are a Race. You talked about Breathing – and the air has been made suitable for a Human to survive upon this planet. It is no co-incidence – there was great planning that went into creating this planet. This planet has been put together by … those from the Higher Realms that have the ability to create. But they have always used the substances that exist upon this planet. They have used it because it already existed somewhere else. So nobody has actually made these things – it comes from The Source of All Creation. It comes from God. And so for anyone thinking they can experiment with things such as genetic engineering – they need to think about The Source. And then work with the Source – with permission from the Source – to be able to work with the new DNA and the changing – and the upgrading – or replacing or the things that Scientists want to do or try. If they work from the Source with that respect – knowing that they didn’t create it but rather it comes from the Source of All – then they will receive the CORRECT promptings to work with. So that health upon this Earth of a human being along with many other forms of life – can be healed, can be cured. It is possible that even malformations can be changed and replaced with other aspects of the human flesh or bone or whatever it is that needs to be changed –to make a happy, healthy body. All these things can happen. Disease would completely disappear. And I am sure everyone would like that. It is possible. It is possible. The knowledge will come from other places – from technology that exists in other worlds – and it will be given readily to the Human Race if they can be trusted with it and not misuse it. Or consider that they own it – because they do not. It comes from the Source of All Creation which has created everything in the Universe. So I have not come to preach, but I would like you to think about these things- and er, if you can – speak about it to others. Particularly to Scientists who may have the ability to change thinking for those who are experimenting. This is worrying us to some degree. Because it is already happening with experimentation – and as I have said it is dangerous unless it is done with permission from The Source of All Creation. So I hope I am getting a message across here – to those that are here and those that read the transcript when it goes on your World Wide Web. Thank you my children, thank you for listening to me this day. I love you dearly. We all love you. All from the Universe, there are many, many here are listening to this particular meeting today. So thank you.